Started the real cutting today. Gave a couple of my most used tools a quick sharpening, then got to the block. I often like to start with negative space, but there isn't much in this image. I did the empty back wall in the left panel first. Then I turned my attention to the floor. I cut out all the empty space, then the geometric shapes that will be part of the color pattern of the carpet. Things were going well, so I stuck around a little longer and cut out the outline of the right side back wall, around the skeeball neon letters. Next time I'll probably start the prize redemption counter and shelves. Work on the block resumed at the Studio this afternoon. Started with pencil, redrawing the skeeball scoring holes. Not perfect, but at least more consistent. Also put in a little netting between lanes. Then it was time to get out the tools. 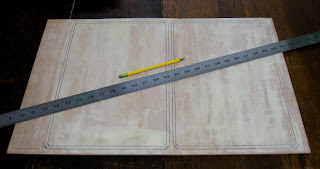 I cut out the outer borders of both panels of the diptych. 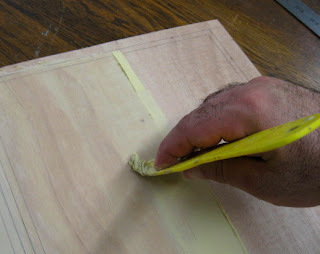 No problems, but I should probably sharpen the tools before I begin the real cutting. Decided to continue work on the block at home again today, while I watched the U.S./Brazil soccer match, which in the end proved a bit disappointing. At least the art portion of the afternoon went well. I finished putting prizes in display cases, this time the ones in the upper left. Mostly appliances- toaster, blender, electric fan, all standard upper level prizes then and now. Threw in a vintage Atari game, since this is meant to be the arcade of my youth, and the modern equivalent is not an uncommon top boardwalk prize now. Not everything in my arcade will specifically be from my memories of Belmar Playland. My memory, confirmed by my cousin, is that the place had a plain concrete floor. Kind of dull, and since most of the current arcades I checked out are carpeted (some of them really wild colors and patterns), I decided my arcade would be as well. The design is based on one of the simpler ones I saw, mostly one color, with random slightly lighter squarish shapes and occasional small black spots. When questioned on the topic, my cousin believed that prizes were not displayed on top of large game machines at Belmar, but this is pretty common now. And since the top of the claw machine in my drawing is pretty dull, I decided to cover it with a giant teddy bear. 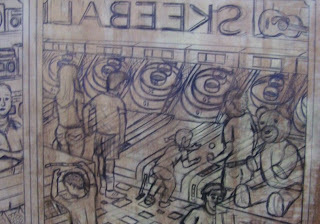 After that, I sketched in the scoring holes and rims on all the skeeball lanes. I will now need to go over everything and make various adjustments (especially to the skeeball scoring holes), but all the elements of the planned image are now in place. I'll make some fixes over the next few days and expect to start cutting by the beginning of July. Actually the block has been at my house the past few days, due to some things in my schedule and the fact that drawing can be done anywhere. Since the last posting, I added one more figure by the skeeball and started filling in prizes- mostly on the shelves behind the prizes redemption counter, plus a guitar in a wall case in the upper right corner. Redrew the lettering for the neon skeeball sign. Almost done. In the early afternoon I drove up to Asbury. I guess it's good for the city that the Cookman Avenue district is getting popular, but parking spots can be hard to find at times. The closest I found was halfway back to the Studio, so in the end that's where I parked, since I was planning to end up there anyway. Walked over to Heaven, where all the art from the Tri City show had been removed from the walls. Most was boxed, while mine was leaning up against a wall in a back room upstairs. I quickly wrapped it and got on my way. Put in a few more hours on the arcade block today. Put in one more machine- a change machine adjacent to the claw game. Added two figures- one walking toward that change machine, and another playing the Asteroids game in the background. I think I need one more figure. I also put in something that had been planned, a doorway and stairs leading to a rooftop mini golf course, as well as a wall sign calling attention to it. Marked out the shelves in the display cases in the prize redemption counter. It's getting close. After leaving Belmar, I dropped off the arcade block in my Studio. With some afternoon hours to spare, I continued up Main through Asbury, picked up Ocean Avenue, and continued on up to Long Branch. The purpose was to see this year's edition of the annual Fresh Meat exhibition at SICA. This time around the new NJ visual arts MFA grads are from Mason Gross, Montclair, and Jersey City. I wasn't particularly impressed. A few interesting pieces, but generally little evidence of technical skills or complex concepts. After looking at the show in the main gallery, I hung out in the cafe for a while (surrounded by the art of discussion group member Jane A. Craven, who has her studio there) with SICA's founder and executive director Doug Ferrari, and a couple of interns, themselves heading off to undergrad art programs in the fall. Sometime after the kids left, we somehow got into a discussion involving a mutual acquaintance. Turns out Doug and I both earned MA's at Montclair State, our years slightly overlapping, and we both had classes with a character named Anthony. A few years later when I was in Carbondale, I asked one of the other grads how he ended up in the program and his response was that "every department needs a problem child." Anthony may have been ours at Montclair. The story I told today involved a mid semester critique in a printmaking class that we were both in. Anthony shows up with a series of large silk screen prints-maybe 10 or 12, multiple colors, editions of 50. He gives a complex explanation for the conceptual nature behind the work, which seemed reasonable to everyone. But the professor had a question- when had he done all the work? The prints represented hundreds of hours of labor, but he had never been seen working on them in class. Anthony's answer- he hired a print shop to do them. His opinion was that the concept was the only important part, so if he could afford to pay someone to do them, there was no need for him to get involved in the process. As a professional artist, he told us, he would not be expected to make his own prints anyway. This led to one of the more spirited in class discussions in my academic career, with pretty much everyone of the opposite opinion. The main argument against his position was that it was a printmaking class, which implied that part of the grade was based on demonstrating the technical ability to make prints. Don't know what grade the professor ended up giving him. However, Anthony was correct in part of his argument- the professional art world would have no expectation for him to be involved in the actual process of making the print, or any other form of art. Plenty of examples out there- in a seminar class he and I both took in 1990 we saw a large SoHo exhibition by Cary Leibowitz consisting of piles of manufactured items, painted, embossed, embroidered, etc with his text. More famous are artists such as Jeff Koons, or Damien Hirst, who recently managed to sell at auction $200 million worth of "art" that he conceived but had nothing to do with making. High end galleries everywhere deal in prints by famous artists (mostly painters) whose only involvement was approving a design and signing the edition. And don't even get me started with the claim of giclees as real prints. This isn't exactly new. Professional artists through all of history regularly had assistants handle some of the less important/skilled parts of their process. Even going back to the beginnings of woodcut in both Europe and Asia, there was a division of labor, with the credited artist responsible for creating the original image, but professional block cutters and printers often taking over after that. There are plenty of exceptions over the years- painters who enjoyed the print process, and pure printmakers who became famous on their own. Woodcut artists of the modern period were generally involved in all phases of production. The print artists who I consider my peers, such as the Outlaw Printmakers, are all people who create their own block/plate/stone/screen and who can print their own work. I wouldn't want to turn over production of my prints to anyone else, even if I could. So was what Anthony brought to that print class art? Absolutely. Did it make him a printmaker? Absolutely not. Does it matter? I guess everyone can decide that for themselves. Took the block on location today, gallery sitting at the Boatworks for the last week of the current Brave New Works exhibition. I've gallery sat enough in this location to know that it's best to bring something to keep busy, since walk in visitors are few and far between. In fact, today there were none, though I did stop to talk to several board members who came through at different times on various BAC business. During my shift I managed to add 3 new figures (2 by the skeeball and one watching the air hockey game), and to improve a bunch of the previously drawn figures. Looking at it now, I'm thinking 2 or 3 more figures should do it, then I'll deal with the other details. 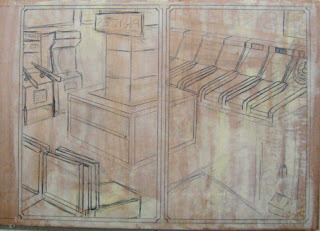 During a brief break between rain storms, I took the arcade block back to the Studio to continue the drawing process. Today it was all figures. I reworked the second air hockey player to make the anatomy a little more logical. 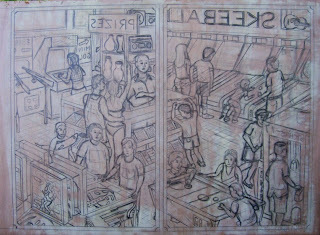 I added a bunch of new figures- a couple looking at prizes, an older guy behind the counter, a kid walking with a prize (a giant stuffed anchovy as seen in the wheel game print), another kid looking at the prize case, and one more child playing skeeball. The latter two are likely to get further adjustments. I need to add at least 4 more figures, and I may add a few more after I see how that looks. After my stop in Asbury last Thursday, I stopped in the Studio just long enough to pick up the current block. That night I had two simultaneous meetings going on in Belmar at the Boatworks- a coordinators meeting, and the critique group that meets (for the moment) on 3rd Thursdays of the month. I bounced back and forth between the two groups, offering art advice in one room, contributing to the discussion on relevant topics in the other. I put my block on display for the small group. Didn't get much input this time, but at this early state I wasn't expecting any. It did give me a chance to retell the story behind it, and everyone seemed excited by it. The block was still in my house today, and between an early Father's Day celebration and the heavy storms that came across NJ all day, I decided to just work on it at home. Got a bit done. I enlarged the claw machine (making it wider and taller) and the guy in front of it, making both a little more proportional to the pinball machines in the other corner. 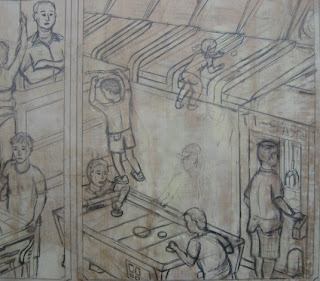 I then drew in the air hockey table, the last structural piece in the image. The rest will be figures and details (prizes, etc). 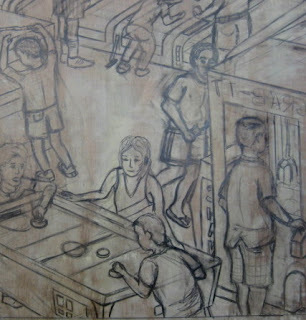 Some of those figures were put in today- the pinball player and the foreground air hockey player. The other air hockey player will be a bit trickier- it waits for now. I put in a rough but fairly complete figure watching the pinball player. 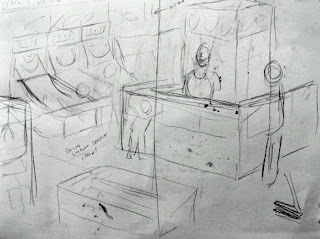 After that I roughly sketched in several other figures- people behind and around the prize counter, someone watching the air hockey game, a kid walking with a prize, and someone playing the video game. I expect to add at least 3 or 4 more, mostly in the skeeball area, but I need to find some references first. About a month ago, the Tri City Arts festival was held in Asbury Park, Long Branch, and Red Bank, and four of my prints were hung in an Asbury space called Heaven. At first I assumed the art would be on display for just the weekend (as happened last year), but then I was told that the owner wanted to keep the art up for about a month. No problem. I stopped by last weekend, and the owner told me that it would be coming down early in the week, so stop by a few days later to pick up my work. Rain was predicted for today, and not wanting to risk my pieces getting wet, I figured I'd wait until tomorrow. Rain was constant most of the day, but it pretty much ended in the afternoon, so I decided to drop by the place after work. Found street parking a couple of blocks away and carried my wrappings to the gallery/store. The shop owner told me that he decided to keep the art up another week, to take advantage of the Collide-A-Scope events this weekend. Collide-A-Scope is a monthly celebration of the arts in Asbury park, usually centered around Cookman Avenue, held rain or shine the 3rd Friday of every month from 7 to 10 pm. 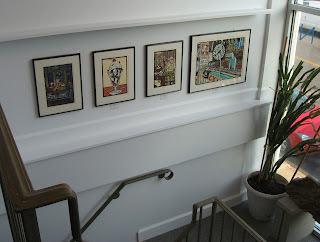 What this means is that everyone has four more days to see the four prints I have on display, seen above. Heaven is located at 721 Cookman Avenue, and is open Thursday to Sunday, 11-5, plus bonus hours this Friday. For more information about Collide-A-Scope, see the Arts Coalition of Asbury Park website. After some tasty treats at the 23rd annual Belmar Seafood Festival, I had a few hours to devote to the latest block. Most of that time was spent working on the skeeball lanes. After looking at it a bit, I decided that another change was needed- the size (width) of the individual lanes was diminishing a bit too much as the row went back into space. The other items in the image of equivalent distance don't do that, and I want there to be some consistency. I shifted the lane lines a little bit to the left along the row. The result is that there are now 6 lanes instead of 7. I think it works better. After that I made some needed adjustments to the "prizes" sign, and worked out some details with the shelves behind the redemption counter. Then I went to the bottom right corner, and drew in a man working a claw machine, based on a sketch done in an arcade a year or two ago. The drawing is fine, but I think the scale is off- it will probably need to be a little larger. I needed to have something down on the block to know that, so it's not all wasted time. The last thing I did was rough in the place where the air hockey table will go. The composition is starting to come together. Short visit to the Studio today. I framed a saint as a birthday gift for my brother. Walked to the gallery in Asbury that's been displaying my work to inquire about the end of the exhibition. (it comes down next week) But mostly I was working on the current block. 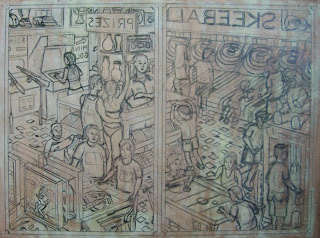 The first thing I had drawn was the skeeball lanes, but the perspective on them (and the implied floor under them) just didn't go with all the machines drawn on the left side. Today I was trying to fix that while making as few changes as possible. I left the orthogonals (the lanes) almost the same, just changing the end points to meet a new horizontal (lane end). 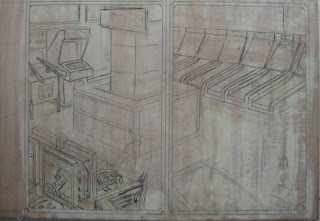 More extensive changes were made to the backs of the machines (the scoring rings), but those had not been fully drawn in yet, so less erasing was needed. I'm not sure that I'm done yet, but what I drew today works better. I'll fix any significant issues that I see in the future, but inserting some figures in front of the skeeball lanes (which I plan to do) may obscure any current flaws. Sometimes when I'm having a hard time figuring out the perspective on something I'm trying to draw, my solution is to make a 3D model of the thing to draw from. 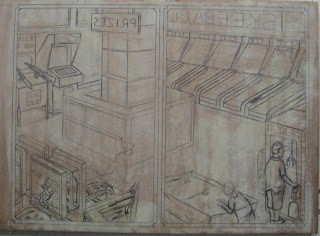 I wasn't satisfied with the roughed in pinball machines after the first day of block drawing- the upright scoreboard was fine, but the drawing of the sloping playing surface was not working. And another visit to an arcade wouldn't likely help, since I'm needing an overhead view from in front and behind, and that's just not possible. So the solution was to make my own little pinball machine. 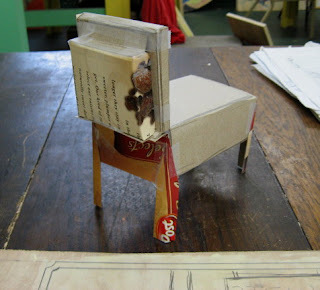 A cereal box was opened to make a single sheet and as much of the structure as could fit was drawn in. I cut, folded, taped and glued, added a little reinforcing, and I had my machine. Used it to get the angles and proportions right. Then I went to the upper part of the left side panel and drew in a specific classic arcade video game next to the shooting game, which was also refined. With the basic shapes done, I decided to put in a little time doing the details of the graphics on the various machines. May need a little tweaking later, but these things are pretty much done. The various figures that will be added may obscure a few things anyway, so no point in worrying about it until they are in there. 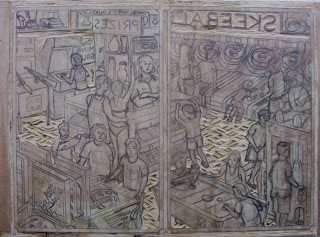 Today I officially started on the 3rd print in the Floating World series, this one devoted to boardwalk arcades. 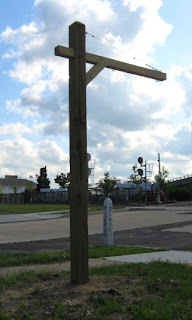 It's not that you have to go to a boardwalk to play any of the games that would be found in a typical arcade, but they are traditionally part of all boardwalks. Research for this one goes back as far as 2007, and last fall I started doing location sketches of some of the machines. A trip to some local beachfront arcades last week helped me obtain a lot of details that will be helpful to the final print. This print will pull information from multiple locations, but it's mostly based on my memories of Belmar Playland, a huge arcade with a rooftop mini-golf course, which occupied most of an ocean front block in Belmar for decades, before being cleared away several years ago to build yet more expensive houses. I'm looking back in time for two reasons. First, there's an upcoming exhibition at the BAC with a theme of Belmar Memories, and this image (which would need to be done at some point anyway) would certainly suit that. Second, other than reference material, the thing I came away with from my recent visit to the arcades was learning that today's arcades are not very fun anymore. I mentioned in a previous post that the majority of games are devoted to the winning of prizes, by either earning tickets/tokens for redemption, or direct action like a claw machine. Since the prizes don't interest me, there is no point in playing most of them. 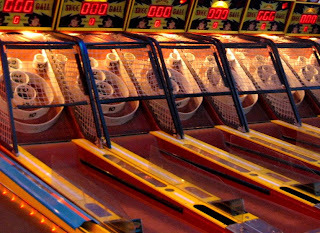 (I still enjoy a little skee ball now and then, more to test my skills than for the two bit prizes that can be earned in a short session) Other than the prize games, most of the arcades had a few large driving games, that stupid dance game, and maybe a pinball machine or two. Traditional video games were few and far between; I'm guessing that today's high powered home gaming systems have killed demand for quarter operated machines. The Belmar Playland of my youth had all the prize oriented games, but also rows and rows of pinball and video games, fun for their own sake. So I decided to model my arcade on the ones I remember for the late 70's/early 80's, when those traditional games were still big. 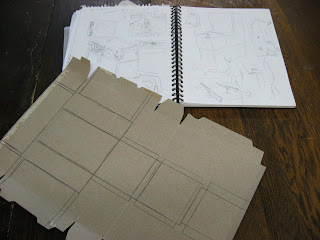 The top photo shows the first 9"x 12" paper sketch, representing a portion of the diptych. 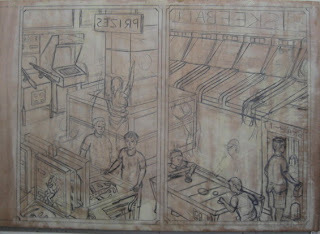 The second photo shows a full size sketch, which includes a few more items. At this point, I consulted with a few people older than myself who were familar with that arcade, a supervisor at work whose family had a summer house in Belmar in the 60's/70's, and my cousin Todd, who grew up in nearby Wall. A lot of what they recalled confirmed my hazy memories of the place. 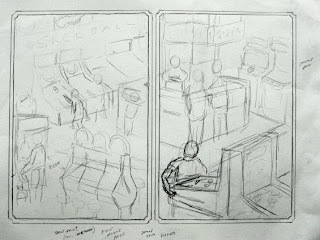 (for compositional reasons, I'm consendensing the arcade's actual layout) I started my block sketch today in the upper right corner, putting in skee ball lanes and a piece of the prize redemption counter. On the other side I continued the counter and started putting in some games in the back. One is a rifle target game. (one of my sources says they had them in Belmar, one says they didn't, but they were regular visitors in different decades, so I'm going to include it as an example of a vintage game) The other will be a classic video game, but I haven't decided which one yet. 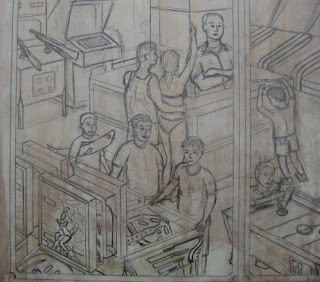 In the lower left I started roughing in some back to back pinball machines, but they need a lot more work- I may have to construct a 3D model to get the perspective right. In the lower right I roughed in some claw machines. I'm thinking an air hockey table in space next to those, but that could change. Long way to go, but it's a good start. Spent a few hours in the Studio doing this and that, while Molly was busy working on her long in process giant fish table project. 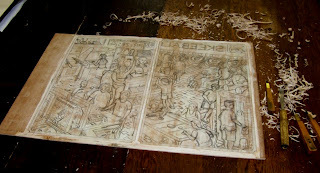 My main reason for being there today was to prepare a block for the next boardwalk print. I cut a piece of plywood to the standard size (16"x24"), marked out the rough dimensions of the panels, then surfaced with wood filler. 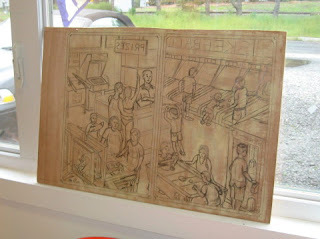 After that dried, I sanded it smooth and drew in the panel borders. I'll be back in a few days to start filling in those panels. After my day at PCNJ, I found my way down to the Belmar for the opening reception of the Brave New Works exhibition. By then most of the crowds were gone, but I did explain my piece to a few people who were curious as to my process and the idea behind it. Didn't bother to take any photos in there, but I may get some later from others in attendance and if so I'll post them on the web. Today I was up at the Printmaking Council of New Jersey's headquarters in North Branch Station for the annual members meeting. Early in the day there was an art demonstration, but I wasn't going to get up there early enough for that. I arrived around noon, in time for the pot luck lunch. My contribution was a couple of loaves of focaccia with various toppings, baked last night. They disappeared pretty quickly, along with the rest of the food. 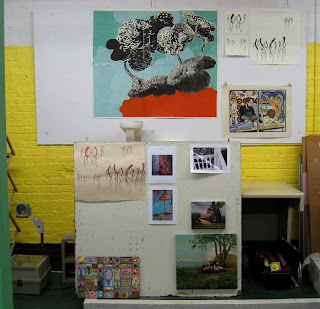 I ended up spending some time talking with someone who remembered meeting me at the Studio when she took what must have been one of Molly's first silkscreen classes. After that was the main meeting, a mixture of interesting information and tedious but necessary business. 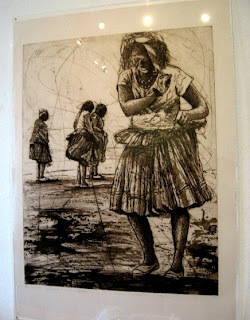 The art on display in the gallery there right now is a show called Reclaiming Lives: Prints by Members of the ArtistProof Studio in Johannesburg, South Africa. It's a pretty good show, with a variety of print media and styles. 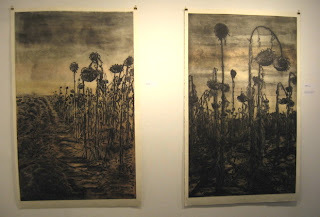 Some favorites of mine are shown above- a drypoint from Phillemon Hlungwani, and some lithographs from Kim Berman. If you're in the vicinity, it's worth a look and it's free. The exhibition remains on display through August 3, 2009. See the PCNJ website for more information. Tonight I went to a Salon event at the Belmar Arts Council. We have these once in a while- artists who have work on the wall during an exhibition are invited to talk about the pieces. Not a critique, just a brief explanation and maybe a few questions. We had the regular monthly member meeting in the back room, then moved to the front room for the discussion. There are about 50 works in the show, and maybe 8 or 9 of the artists were present tonight, including me. 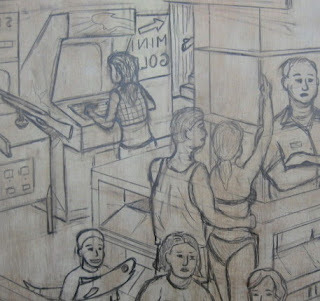 A little part of my print (the boardwalk tattoo print) can be seen at the far right of the above photo. Mine was probably the most unusual of all those we looked at tonight, but it got a good response. If I make it to the reception on Saturday, I'll probably be explaining it to a lot more people. It looks like the next print in the boardwalk series will focus on arcades. The reason I'm thinking of doing this one next is that there is a group show coming up in August, and this print would fit well with the theme of that show. Whether or not I can get it done in 2 months is another story (the others took 3 to 4 months each, but I had more going on at those times). If it's going to happen, I need to start as soon as possible. I had some on site arcade sketches going back to last year, and had done some internet research in recent weeks, but I knew I needed more information. I had the day off from work, so I took some trips. In the early afternoon I took a walk to the beach in my hometown, ending up at an arcade/pizza place. 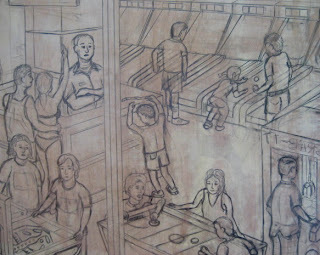 Had a slice, then went into the arcade to take some photos and do some sketching. (skee ball will definitely be part of the image) Thought I could use more, so when I got home I got into the car and drove to Point Pleasant, where the boardwalk is home to several arcades. (this time of year, while kids are still in school, free street parking is still widely available) Found a few more things to sketch. What strikes me about all the places is that the emphasis is more on winning prizes (crane games or things like skee ball that pay redemption tickets) with very little general amusement, games for their own sake like pinball or traditional video games. The arcades of my youth also had the prize games, but I remember a lot more of the amusement games. I expect to have an even mix in my print. Tonight was the latest of the monthly critiques that take place here in the Studio. We had eight artists present work, plus two of our regulars came just to participate in the discussion. 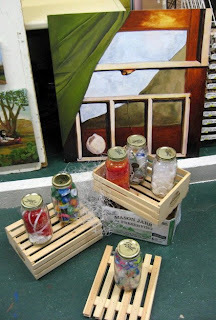 The art tonight included painting, mixed media, prints, photos, and sculpture. The top photo shows what we had at the start, and the bottom photo shows two late arriving works. As always, it was a fun evening and everyone got some useful feedback for their recently finished and/or in-progress work.